You may have heard it said that when a white shark attacks a surfer or swimmer in the water, the shark has made a mistake. 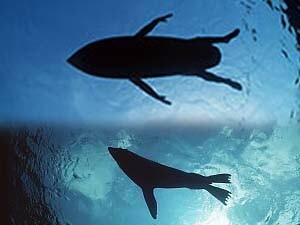 It has confused its natural food source, a seal or sea lion, with a human. Humans are not on the sharks menu, this has been common knowledge now for many years, but there are still around 5 or 6 fatal attacks on humans each year. So why is this happening? Mistaken identity? Or something else. The following is my personal opinion. When a surfer puts on his/her wetsuit, and paddles out on their surf board waiting for a wave, you could say the shape might resemble that of a seal on the surface, and that would then reasonably justify why a great white shark would decide to attack a human. From watching these sharks in South Africa, and spending hours upon hours watching documentaries and reading up on these predators, I have a hard time putting the reason down to a simple mistake in identity. A full on attack occurs when the shark is 100% sure that the object is worth using valuable energy to go for. When this takes place, the 1 ton fish launches its self vertically from the ocean floor, and hits the seal on the surface at speeds of up to 30 mph. Often this is a very spectacular attack, with the shark flying out of the water, sometimes up to four meters high. The reason for this ambush attack is to protect itself, with the seal disabled in one hit, the shark can keep out of the way of its sharp teeth, and return to consume once the seal has bled to death. The second is when the shark isn’t completely sure about what it is seeing on the surface, so the shark will slowly swim up from the bottom, and check it out. White sharks have excellent eye sight, and use this sense to get a better idea of what it is they are interested in. But sometimes thats not enough for a shark, they want to feel what it is. When this happens, the shark will place its jaws over the object, scientists call this ‘mouthing’. The shark clamps down with the same bite force as a human, hardly anything to a shark. The reason for this is to get an idea of what the object is, and if it’s worth pursuing further interest. This is ‘Trix’ in Mossel Bay, showing her natural curiosity on our steel cage. She did this three times in the space of half an hour. Photo by Brian Scott. Its worth saying at this point that white sharks are highly curious animals, they love to know what things are. 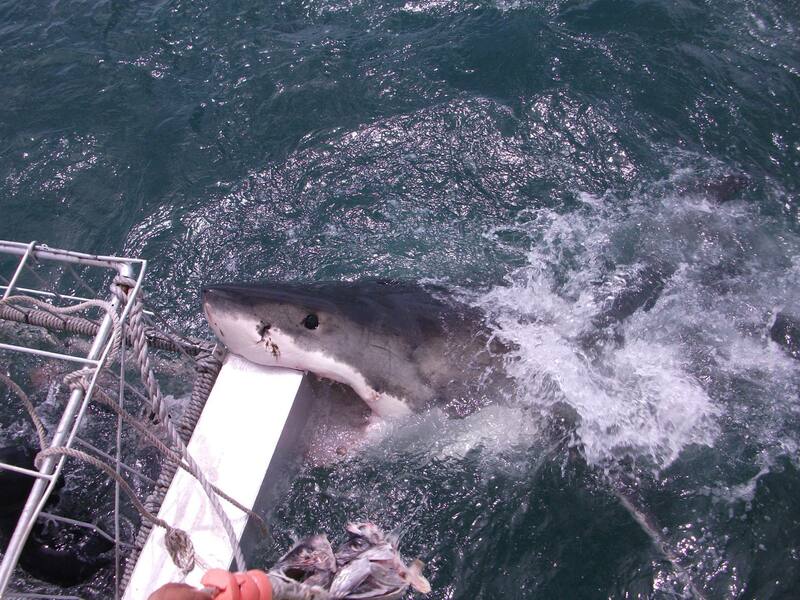 Working on the cage boat in Mossel Bay, it wouldn’t be unusual for a shark to mouth the propeller, or steel cage attached to the side of the boat. Always done with care and gentleness. Perhaps not words you would expect to hear describing a shark. When we hear of a human being attacked by a shark, the story usually involves the surfer losing a leg, or an arm. If death is a result, it is due to shock or loss of blood. So hang on a min, can that still be called an ‘attack’? That to me sounds quite tame, when we compare that with whats happening to those poor seals! If a great white shark, cruising along the ocean floor looks up, sees a surfer and mistakes him/her for a seal, then it makes sense for that shark to attack the surfer, like it would a seal, doesn’t it? If this was the method of attack used on surfers, it wouldn’t be the case of losing an arm or a leg, it would be ‘game over’ in a second. There’s simply no surviving that kind of force. Fortunately these kinds of attacks are virtually non existent, which in my view rules out the option of mistaken identity. Once the shark has removed a limb from a human, it usually then disappears, showing no further interested in consuming their victim, which again shows the lack of interest they have in hunting us. We are simply not worth the effort. There is another theory I heard from a scientist in Simons Town, South Africa, last January. 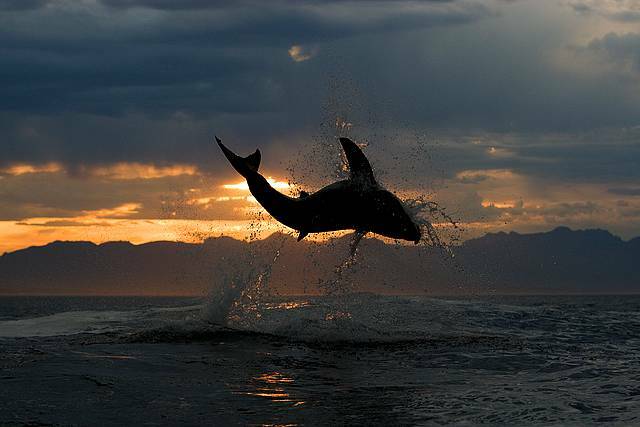 During the summer months the white sharks are hunting fish and rays in the shallows, bringing them much closer to shore. While hunting they might encounter another predator, a shark, or in another case, a human. The shark then gives a threat display, by lowering the pectoral fins and opening its mouth, this is to say, “you are on my patch, this is a warning”. Another shark sees this threat and gets out of there as fast as its tail can manage! However usually the visibility is low in these cases, and so the human doesn’t see the shark, and carries on with their swimming or paddling activities. The shark reacts to being ignored by swimming up and giving a warning bite. In Mossel Bay many sharks displayed evidence of shark bites, usually on the flank, these scars could have been made in this way. To a shark this is no big deal, they have very tough skins, however to a human, it is a big deal, again it can mean losing a limb and bleeding to death. The interesting thing about this theory is the fact that these sharks, the apex predator in the oceans, are actually viewing us as another predator in the water. There is certainly lots of evidence to support this by the behaviour of sharks around the cage boat. There is a respect shown to humans by sharks, and sadly a severe lack of respect shown the other way. 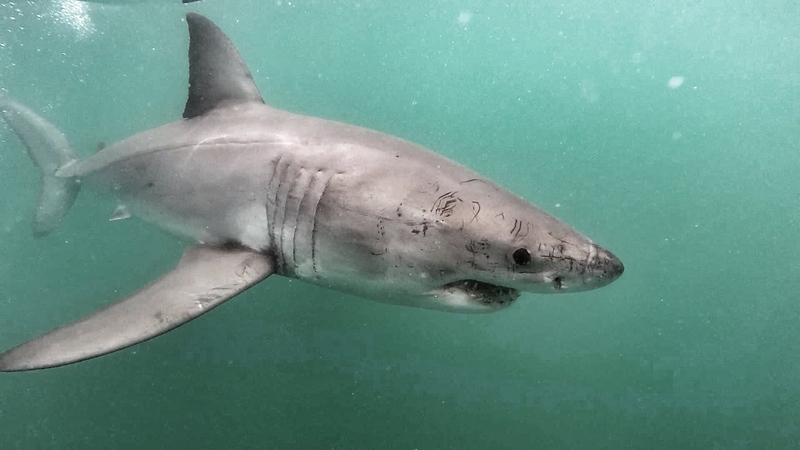 There is a lot to be said of a white shark’s intelligence, when you consider how many thousands of people enter the water each day, and how few cases there are of shark encounters (yes, we will now call them encounters, not attacks). Just 1 kilometre from Seal Island in Mossel Bay is a very popular tourist beach. There is no recorded attack on a surfer or swimmer by a shark on that beach. It’s time to respect these animals as the supreme apex hunters they are. All text and images are copyright Dan Abbott unless otherwise stated and must not be reproduced without permission.